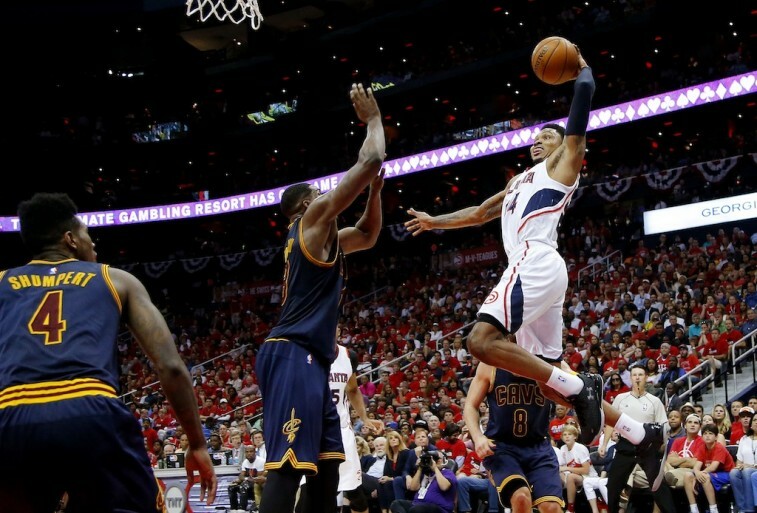 If Wednesday’s Game 1 of the series between the Cleveland Cavaliers and Atlanta Hawks was an indication of things to come, this Eastern Conference Finals is going to be a classic. 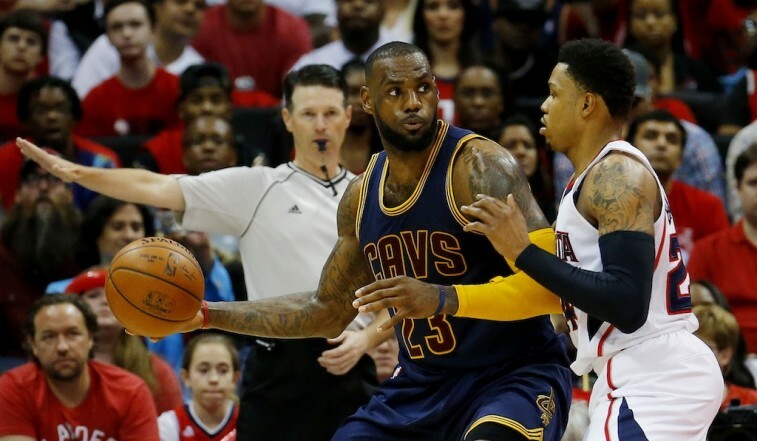 With a 97-89 victory, LeBron James and company stormed into Atlanta and stole home court advantage away from the East’s No. 1 seed. This game was hard-fought, entertaining, and filled with highlights. The atmosphere at the Philips Arena was electrifying, and players on both sides were happy to put on a great show for the rowdy crowd. If you tuned into this matchup, then you are well aware that this contest had a little bit of everything. The two beasts of the East played a physical game where each had the opportunity to come away with the ‘W.’ This game featured vicious slams, unconscious shooters, and a potentially devastating injury. Whichever team is hoping to represent the East in the NBA finals will need to be at its best for the remainder of the series. Both of these clubs are too good not to bring it every night. We can’t wait to see how it plays out. Of course, while this series could go either way, and each team is likely to make plenty of adjustments throughout, we feel there was a lot that one could learn from watching this crucial opening game. With that in mind, based on our observations, here’s a look at five takeaways from Game 1 of the Eastern Conference finals. King James made it a point not to settle for outside shots. The best player on the planet only took one three-pointer the entire game (he missed), but he still came away with a game-high 31 points. ‘Bron was 12 for 26 on the evening and forced the Hawks to guard him in the paint — they had no answer. The same strategy was working well for Atlanta; until, of course, the team stopped penetrating. In the first half, the Hawks were 11 of 11 at the rim and 12 for 15 on 16 drives for 26 points. The plan to get to the bucket was working for the first 24 minutes. Unfortunately for the home team, it deviated from this tactic in the second half. Atlanta only had seven points on 11 drives in the final two quarters. Granted, the Hawks were trying to get their shooters going, but that wasn’t happening — they only managed to hit four three-pointers on 23 attempts. The shots may start to fall, but when attacking the rim is working, stick with it. 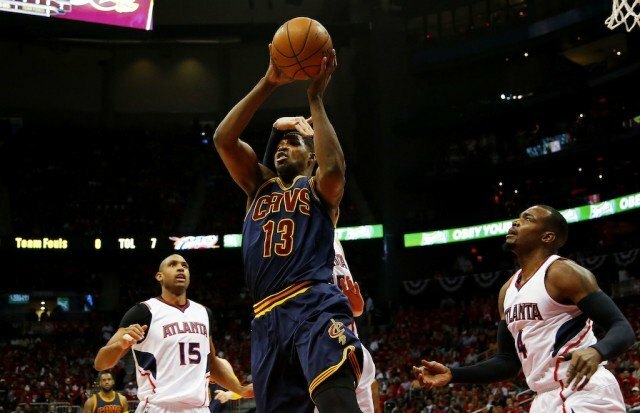 The Cleveland Cavaliers dominated the Atlanta Hawks on the boards. With Tristan Thompson collecting 10 rebounds and Timofey Mozgov pulling down 11 of his own, the Cavs outrebounded the Hawks 49-37. While many expected Cleveland to control this category, what ended up being the real difference maker was the team’s ability to rebound of the offensive end. For a team that runs a ton of isolation sets, it’s imperative that the Cavaliers find a way to get second-chance opportunities. This was huge for them in Game 1. Thompson was an absolute beast on the offensive glass, grabbing five on the night. But he wasn’t alone. Mozgov was an animal as well, collecting four offensive boards before the game was over. The Cavs finished the evening with an offensive rebounding rate of 28.6% (Atlanta’s was only 15.9%). The Hawks can’t afford to let this happen again. 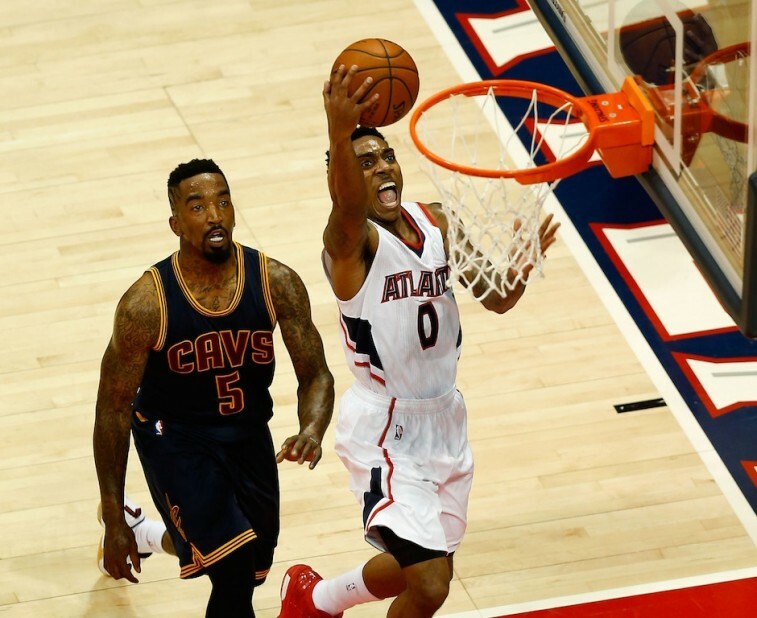 The Cavs have no one who can stop Jeff Teague. It’s as simple as that. The Atlanta point guard dropped 17 first-half points and finished with 27 in total. The 6-foot-2 All-Star was crafty, composed, and totally confident. He only hit one three on the night, but everything else was working for the 26-year-old out of Wake Forest. The moment Teague recognized Cleveland’s inability to guard him, he went to work. He used his high basketball IQ to find ways to get to the rim, and continuously posted up the smaller Cavs defenders. Teague should have a field day in this series. But if he doesn’t get more help from his teammates, then the Hawks could be facing the end of their season. The Cavaliers have been dealing with injuries for a little while now. Kevin Love has been sidelined since he dislocated his shoulder in the Boston series and many of the team’s stars are playing through pain of their own. James rolled his ankle pretty badly against the Bulls, Iman Shumpert has a hurt groin, and Kyrie Irving has a sore right foot and the tendinitis in his left knee keeps flaring up. They’ve been battling this adversity all postseason, and are well aware that at any moment someone else could go down. Unfortunately for the Hawks, this may have just happened. Without Thabo Sefolosha — on account of a broken leg he suffered from a nightclub incident — Atlanta was already down an important perimeter defender. However, at least the team still had DeMarre Carroll to handle those necessary assignments. That was until he went down at the end of Game 1, with what looked like a serious knee injury. We won’t know how bad the situation is until Carroll gets an MRI on Thursday. 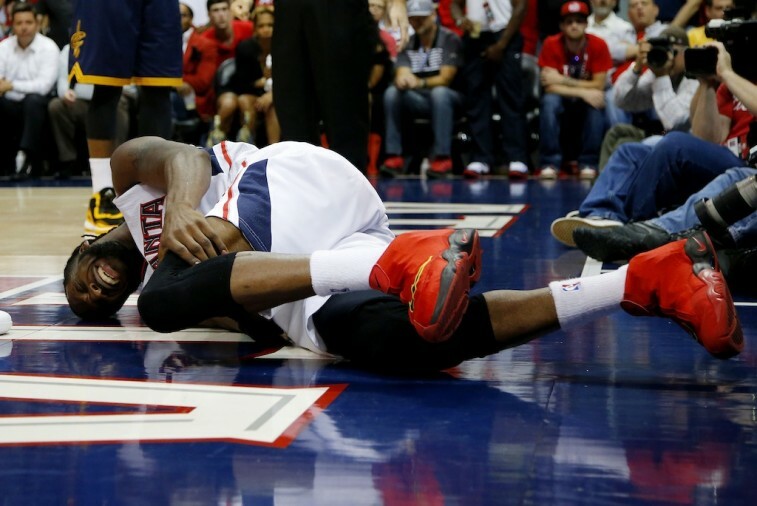 But if he’s out for an extended period of time, the Hawks are in serious trouble. According to ESPN Stats & Info, during the postseason, Atlanta has been 12 points per 100 possessions better with Carroll on the court. He is a crucial cog in the wheel and, quite possibly, the heart of this team. The Cavs have already shown an ability to overcome big-time injuries. Now Atlanta may have to prove it can do the same. This should be a key to the series. 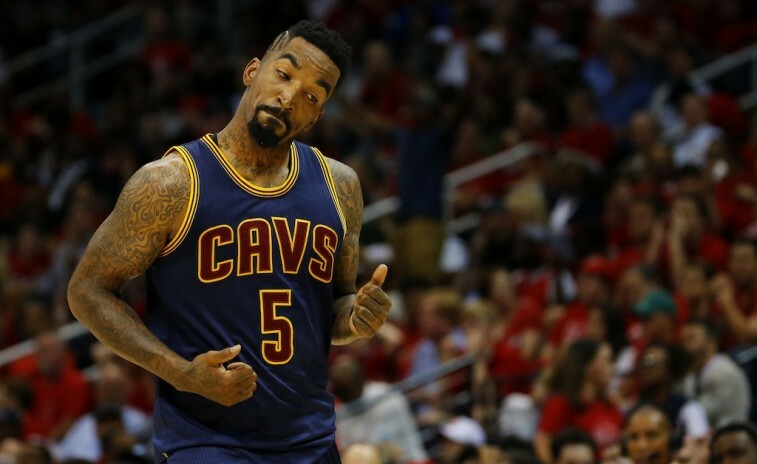 Since coming over from New York, J.R. Smith has already proven to be worth the risk for the Cleveland Cavaliers. But his Game 1 performance went beyond the organization’s wildest dreams. Coming off the bench, Smith caught fire from the outside. He made 10 of his 16 shots, including nailing eight three-pointers. It didn’t matter if his shots were contested or off balance, Smith was a man in the zone. And as they’ve done since acquiring him, Cleveland let Smith continue to fire away. It certainly paid off. Without his 28 points, the Cavs would more than likely be trailing in this series. But Smith provided the spark Cleveland needed, and he even accounted for the club’s entire bench scoring. We don’t expect this streaky shooter to have another game quite like this. After all, he’s not Stephen Curry. Still, it’s clear that he’s excited for the opportunity to play in the conference finals. Should his shot start falling again, you can expect the Cavs will be happy to oblige him. All statistics are courtesy of Basketball-Reference.com and ESPN.